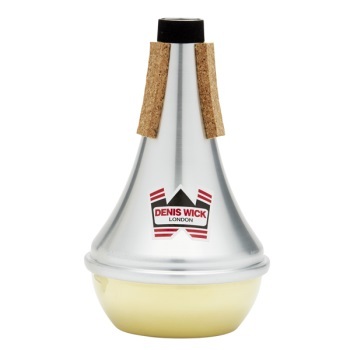 A brass-bottomed version of the world’s favorite trumpet mute! Since the DW5504 was first designed in 1968 it has given trumpet players exactly what they need: a mute which is perfectly in tune in all registers, a great feel which doesn’t affect the ‘blow’ of the instrument, and the ability to produce a searing fortissimo in orchestral tuttis. This brass-bottomed version is heavier than the regular aluminium style, and provides a brighter tone with the ability to project with a more cutting sound in the orchestra. This version is preferred by many top orchestral players. The reason for the success of this Denis Wick mute lies partly in the brilliance of the design and partly in the care and precision of the manufacture. The design has created a very open mute, bigger than all its predecessors, giving a full sound and avoiding the problem of sharpness of pitch encountered in many trumpet mutes. The hand-spun aluminium is both light and extremely resonant. Other manufacturing techniques produce mutes which are not as hard. Our hand-crafting produce a mute where the metal is ‘work-hardened’ making it both light and very resonant. This makes it free-blowing and extremely responsive and the choice of the most demanding musicians. Real cork is used to produce a snug fit in the bell of the instrument. We are proud that this mute is used by thousands of musicians all over the world and yet also represents incredible value. This is one of the most important pieces of equipment a trumpet-player will ever purchase, but is available at an incredibly reasonable price.